SEATTLE--(BUSINESS WIRE)--Sep. 8, 2016-- (NASDAQ: AMZN)—Amazon today announced the all-new Fire HD 8, the next-generation Fire HD tablet designed from the ground up for all-day entertainment. With an 8” widescreen HD display and quad-core processor, Fire HD 8 now offers an incredible 12 hours of battery life, 50% more RAM for faster performance, and 2x the on-device storage, plus support for up to 200 GB of additional storage via a microSD card—all for only $89.99. Fire HD 8 also introduces Alexa, the cloud-based voice service, for the first time on Fire tablets—just press and ask—Alexa can play music, launch games, read audiobooks, and more—coming soon. Fire HD 8 delivers access to millions of movies, TV shows, songs, books, apps and games, as well as exclusive features like X-Ray, ASAP, Second Screen, Underground, and On Deck. With its 8” HD display and portable size, Fire HD 8 is the perfect tablet for entertainment. High-definition display—8” widescreen (1280 x 800) HD display with over a million pixels (189 ppi) for bright, vivid image quality. Fast performance—With a quad-core 1.3 GHz processor and 1.5 GB of RAM—50% more RAM than the previous generation Fire HD 8 for faster performance when playing games or launching apps. 2x more storage—With options for 16 GB or 32 GB, and support for up to 200 GB of expandable storage via microSD. All-day battery—4,750 mAh battery for up to 12 hours of mixed use battery life for a full day of power. Incredible reliability—As measured in tumble tests, Fire HD 8 is 2x more durable than the iPad Mini 4—and costs $300 less. Dolby Audio—Fire HD 8 stereo speakers are custom-tuned for immersive, high-quality sound. Fire OS 5—Includes a user interface that replicates the look and feel of a magazine, making browsing and searching for your content easier than ever—now with support for Comixology and Twitch. Alexa—Simply press and ask to enjoy music, listen to audiobooks, ask questions, shop, find news, hear the weather, and more on your Fire tablet. Amazon Underground—A one-of-a-kind app store experience where thousands of premium apps, games, and even in-app items are 100% free—including extra lives, unlocked levels, unlimited add-on packs, and more. On Deck—For Prime members, On Deck automatically keeps your Fire tablet current with popular Prime movies and TV shows, as well as Amazon Original Series. For customers that aren’t yet Prime members, On Deck downloads first episodes of Amazon Original Series—so you always have something great to watch. World’s best content ecosystem—Access to millions of movies, TV shows, songs, books, magazines, apps, and games—with free, unlimited cloud storage for all Amazon content. Amazon-exclusive features—ASAP, X-Ray, Second Screen, Family Library, Amazon FreeTime, Prime Video downloads, Blue Shade, Word Runner, and more. Four fun color options—Black, magenta, blue, and tangerine. It just got even easier to enjoy endless entertainment on your Fire tablet with Alexa, the cloud-based voice service that is the brain behind Amazon Echo. When connected to Wi-Fi, simply long-press the home button and ask Alexa to play your favorite song, open a game, or read you the latest audiobook—Alexa provides quick access to the entertainment you want. Plus, you can ask Alexa for the news, weather, jokes, questions, and more—Alexa provides natural-language responses, combined with on-screen information on the tablet’s display. Third parties can publish Alexa skills, so you can ask Alexa to play music from services including Pandora and Spotify, and turn off the light or adjust the temperature on compatible smart home devices. 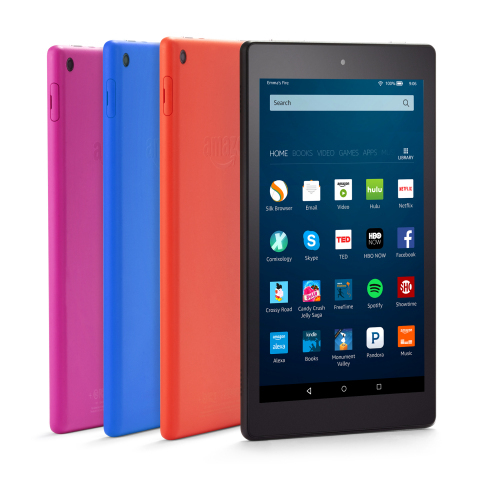 The all-new Fire HD 8 is available for pre-order beginning today with 16 GB or 32 GB of memory starting at $89.99 at www.amazon.com/firehd8. Fire HD 8 comes in four fun color options: black, magenta, blue, and tangerine and starts shipping September 21. Protective covers are also available for Fire HD 8 in black, magenta, blue, and tangerine and can stand in both portrait and landscape orientations, starting at $29.99. Fire—Starting at $49.99, Fire—Amazon’s best-selling tablet ever—offers a 7” IPS display, quad-core processor, front- and rear-facing cameras, 8 GB or 16 GB of internal storage, plus expandable storage options, and 7 hours of mixed use battery life. Fire is available in black, magenta, blue or tangerine colors at www.amazon.com/Fire. Fire HD 10—With a beautiful 10.1” HD display, Fire HD 10 is Amazon’s largest and thinnest tablet yet, featuring a powerful quad-core processor running at up to 1.5 GHz, 5MP rear-facing camera and HD front-facing camera, and with 16 GB, 32 GB or 64 GB of storage, plus expandable storage. Perfect for watching widescreen entertainment, Fire HD 10 is available with a black or a silver aluminum enclosure starting at $229.99 at www.amazon.com/FireHD10. Fire Kids Edition—Built especially for kids (and their parents) Fire Kids Edition comes with a Fire tablet, a kid-proof case, one year of Amazon FreeTime Unlimited with access to 13,000 videos, books, educational apps and games, access to 20,000 hand-curated and age-appropriate websites and YouTube videos, plus a two year worry-free guarantee—all for only $99.99. Fire Kids Edition is available at www.amazon.com/FireKET.